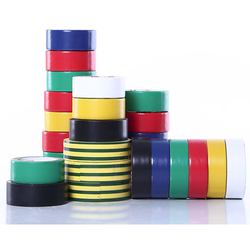 We are a leading Manufacturer of pvc insulation tape from Bengaluru, India. Featuring electrically insulated Electrical PVC Insulation Tapes utilized in the manufacturing of automobile harness, joint of wires & cables, packaging, color code indicator, floor marking and paint masking. Our wide range of PVC insulation tapes Also include flame redundancy, resistant to voltage/acid/ alkali/ cold etc.